Is That A Film Camera? One of my AE-1 Programs. A little over ten years ago, a close friend gave me her old film camera complete with a few accessories, a telephoto lens, and a nice bag to go along with it. At the time, I was just beginning to get into photography but I was more interested in the new fancy digital age that was becoming so popular. I really liked the idea of having a film camera, but I was also nervous about it as well. I thought of film as a strictly professional tool only professionals used, not some twenty-something kid who didn’t know the first thing about film or photography. So I thanked her, and I was very grateful and excited, but the film camera just seemed too intimidating to me and it disappeared into my closet. Once in a while I would take it out, examine everything and think, one day I’ll use this. I moved around frequently during this time in my life and I always took it with me, not ready to use it but definitely not ready to give it up. A little over a year ago, I was having dinner with my photography mentor and we were discussing film. He had been encouraging me to shoot film for some time and I just didn’t feel like I had it in me. Isn’t it expensive? Isn’t film dead? Depends and No! As we were talking about it, I casually mentioned I did have a film camera, but it probably didn’t work and would need to be cleaned at the very least. He asked me what it was and I said, “I think it’s a Canon AE-1.” Boom. I thought he was going to jump out of his seat. He gushed over the camera’s quality and popularity. Next thing I know, he hands me a few roles of film and that was it. I took the camera in to be cleaned and check to see if it even worked. It passed with flying colors. So I loaded up some film and started hunting for shots worthy of film. Having only 36 exposures to work with, I felt really limited and did not want to waste anything. I didn’t even know if I had my settings right (enter photo mentor to the rescue again). Next thing I know, I’m over at a friends house taking photos of her niece and nephew. From the first roll I shot with the Canon AE-1, Kodak Portra 800. It was different and it was fun. A lot of fun. I had become so used to viewing my photos right away thanks to digital cameras, that I felt totally in the dark. I had no idea what was going to come out and if I had set everything right. But all those worries just disappeared and I began to enjoy the camera. It forced me to slow down and take time framing my shots. My AE-1 has a standard 50mm lens on it (which I use all the time), and that forced me to physically move around more. It completely changed the way I approached photography, digital or film. It was a really wonderful experience and I learned a lot that afternoon. Since then I’ve taken the Canon AE-1 with me just about everywhere. 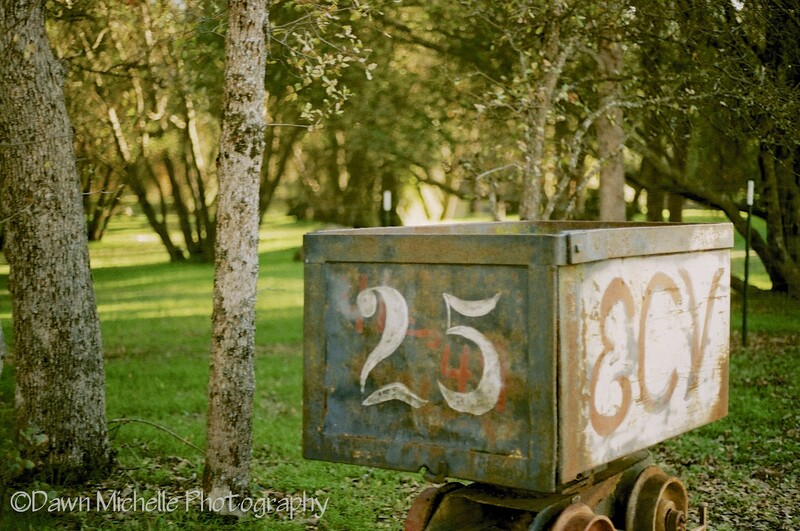 I primarily use the Kodak Portra film, but I have used Fuji film before. Both are excellent, but I lean towards the Portra because I feel my images come out a little warmer, whereas the Fuji tends to lean on the cooler side. Really, it just depends on what I’m shooting and who the subject is. Eventually, I plan to branch out and play around with other films, but for now I’m happy bouncing between the two. Shooting film has been a wonderful experience for me. And it’s not just the photography part. When I am out in public using this camera I am constantly stopped and asked about it. I’ve met some great people and have had some really interesting conversations with random passerby’s, always asking, “Is that a film camera? Can you even buy film anymore?” Yes and YES! I’ve been asked a few times what film means to me, and the truth is… I don’t really know. But I know it makes me feel things. I feel excited and anxious to have a roll developed, wondering what turned out and what didn’t. I’m ecstatic when something works or turned out better than imagined. I just feel inspired and refreshed to use it. It’s like meditation, but for photographers. A real bonus are the sounds it makes. Snapping a pic gives off an old mechanical sound that is just so pleasant to listen to. Hearing the film advance with the pull of a lever is oh so satisfying. The camera body itself just feels right in my hot little hands. It’s just a really cool camera that was designed well enough to stand the test of time. Prior to using film, I was feeling kinda blah about photography. I was very uninspired and not feeling challenged. I knew I needed a change, but I just wasn’t sure what. I’m glad I hung on to this camera for all that time. I also wish I wouldn’t have been such a wuss and dived into film sooner, but what’d ya gonna do? 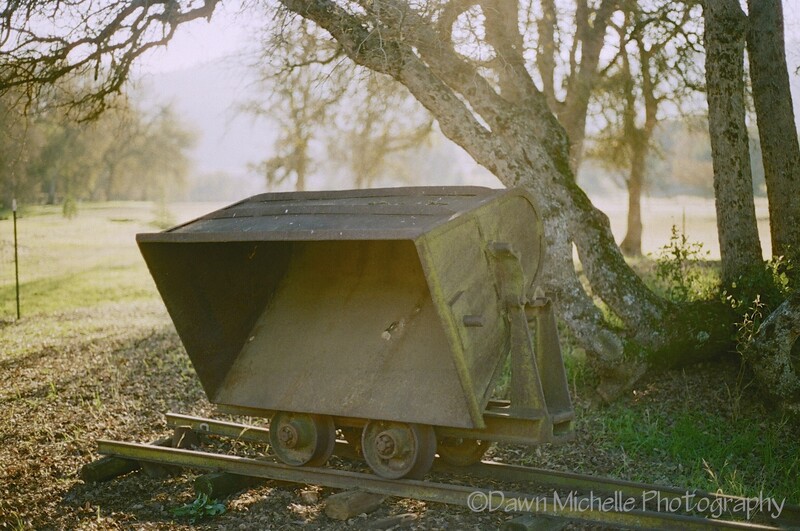 Mariposa, CA – Canon AE-1, Kodak Portra 800…One of my favorite photos I’ve taken. I take this camera with me everywhere now. Every professional shoot I do, traveling, friends parties, anywhere and everywhere. I feel my images have a bit more emotion to them that I can’t always get with digital. What I’ve noticed with digital is that I either get the shot or I don’t. Digital is either perfect or it’s not. But with film, there’s flexibility. When I’m playing around with the AE-1, some images come back over exposed, a little blurry, or even old-fashioned looking… but it looks great. A little more artistic, if you will. Occasionally, I get a bad roll of film, causing light streaks or double exposures, but that all works to my advantage. Thanks to the Canon AE-1, I’m now feeling more challenged and connected to my passion. It is by far one of my favorite cameras. 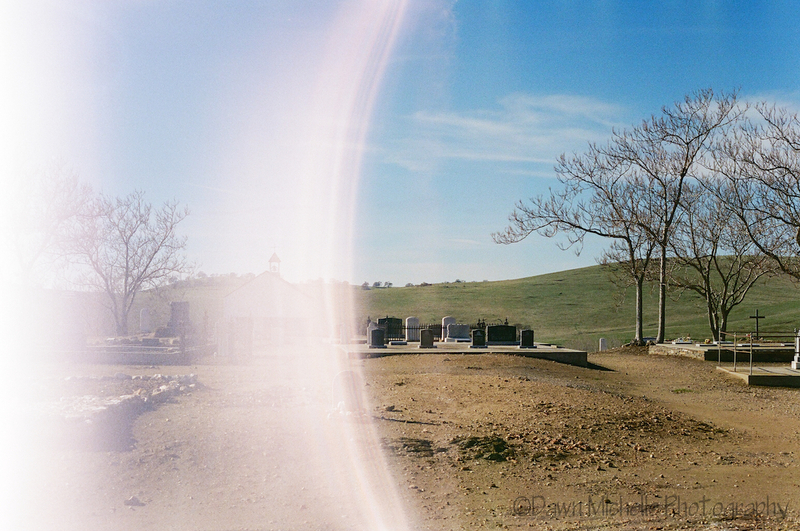 Cemetery in Hornitios, CA – Bad roll of film… it happens….Or is it a ghost? Dun dun dunnnn! This is just a brief technical overview. I’m not a tech writer, so I may leave out some things others might find more interesting. This post is more about my experience and use of the camera. I do encourage you to do your own research on this awesome camera and consider adding it to your bag of tricks. Thanks for reading! 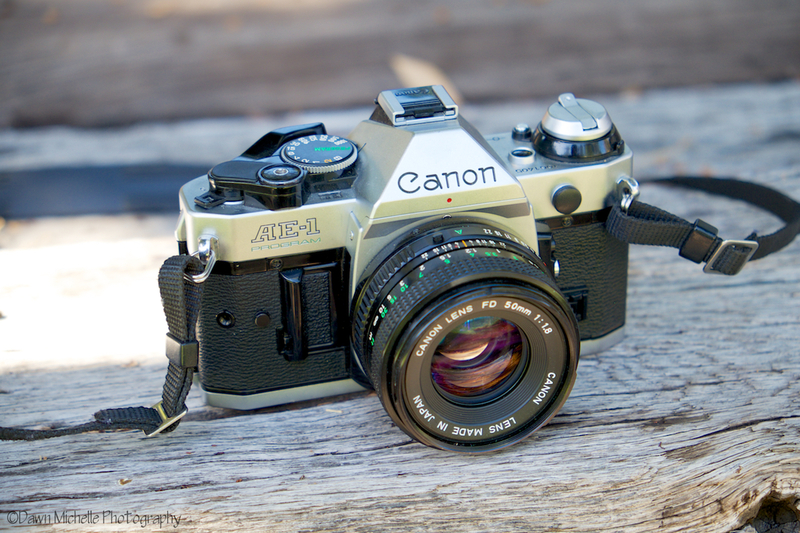 The Canon AE-1 was first introduced in April of 1976 and was in production until 1984. It was a breakthrough design that pushed Canon ahead of the competition. The first of its kind to use a microprocessor or specifically an electronically controlled electromagnet horizontal cloth focal plane shutter, which sits right in front of the film/sensor (a.k.a. fancy gizmos work together to form awesome pics). The exposure control system consists of a needle pointing along a vertical f-stop scale on the right side of the viewfinder to indicate the light reading (this is actually one of my favorite features). The split prism focusing screen is an excellent feature and aids manual focus. The AE-1 was an instant hit reaching over a million units sold and changed Canon’s image for the better. They were officially playing with the big boys now. While it was never meant to be a professional camera, its ease of use and manual control options appealed to the more experienced as well as newbies to the craft. In 1981, Canon developed the AE-1 Program. The major difference between the two is the addition of the Program AE mode which sets shutter speed and aperture automatically. The viewfinder changed from the needle reading (which I prefer) to an LED display. Many are still around today. I (ahem) have three myself: an AE-1 and two AE-1 Programs. Fabulous article! I think that film makes you think a little more about your shots too, before you take them – there is, after all, a limited number. The last time I took film on a trip was over ten years ago and I would say in the group I was traveling with it was 50/50 film/digital – and while the digital camera folks took a lot more photographs, in the end the number of really memorable images from each group was about the same!